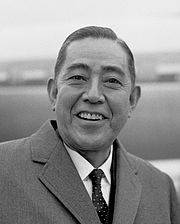 Eisaku Satō‏ (27 March 1901 – 3 June 1975) was a Japanese politician and the 39th Prime Minister of Japan. He was first elected in December 1964. He was the first Prime Minister to have been born in the 20th century. Satō shared the Nobel Peace Prize with Seán MacBride in 1974. He received the award for representing the Japanese people's will for peace, and for signing the nuclear weapons Non-Proliferation Treaty in 1970. Satō‏ was born in Tabuse in Yamaguchi Prefecture. He suffered a stroke on May 23, 1975 and had fallen into a deep coma. He died on 3 June 1975 a Tokyo hospital. ↑ 1.0 1.1 "Eisaku Sato - Biographical". Nobel Media AB. Retrieved 17 December 2015. ↑ "Eisaku Sato". Nobel Prize. The Norwegian Nobel Institute. Retrieved 21 January 2015. ↑ UPI (23 May 1975). "Sato taken to Hospital after a Stroke". The Chicago Tribune, p. 8. Retrieved 17 December 2015. ↑ ALBIN KREBS (3 June 1975). "Eisaku Sato, Ex-Premier of Japan, Dies at 74; Shared Nobel Peace Prize in 1974 for Efforts in Asia". The New York Times. Retrieved 17 December 2015. This page was last changed on 5 October 2018, at 12:33.